A serene lake, a pristine lawn, a hockey game on TV, and an ice cold beer. That’s all Terry wants after his tour in Afghanistan as a doctor in a busy medical facility at the Kandahar Airfield. Based on the experiences of playwright Sean Harris Oliver’s father, Dr. John Oliver, this is an intense telling of the events that profoundly affected three of the hospital’s Canadian personnel. With a 97% survival rate, the Role 3 Multinational Medical Unit was always full of organized chaos. Switching back and forth among the three characters, this play can feel chaotic at times, but the fast pace mirrors the feeling of being in the middle of the action. Kristy (Kyle Jespersen), a field medic, is also trying to get to the root of his own struggles with PTSD. His character was the most stereotypical, but that didn’t make it less effective. His story is perhaps the most traumatic, the most morally fraught, so we feel for him and wonder what we might do in his situation. He suffers an identity crisis upon returning to Canada and explains that he doesn’t know who he is unless he’s back in the chaos of the hospital in Afghanistan. Karine (Siona Gareau-Brennan), a French Canadian from Laval, speaks to us in a mixture of French and English. I don’t think not being familiar with the French would detract from her performance; there was just enough French to convey her personality while she repeated many of the words in English to ensure the meaning was clear. We see Karine struggle not while back at home, but while still in the hospital. She grapples with thoughts of morality, the value of a life, and why she is even bothering to patch up Afghans who might come back and kill them. For me, her character was the most relatable. She was a compassionate nurse who sang lullabies to wounded children, yet she struggled to come to terms with her purpose and the larger meaning of the war. 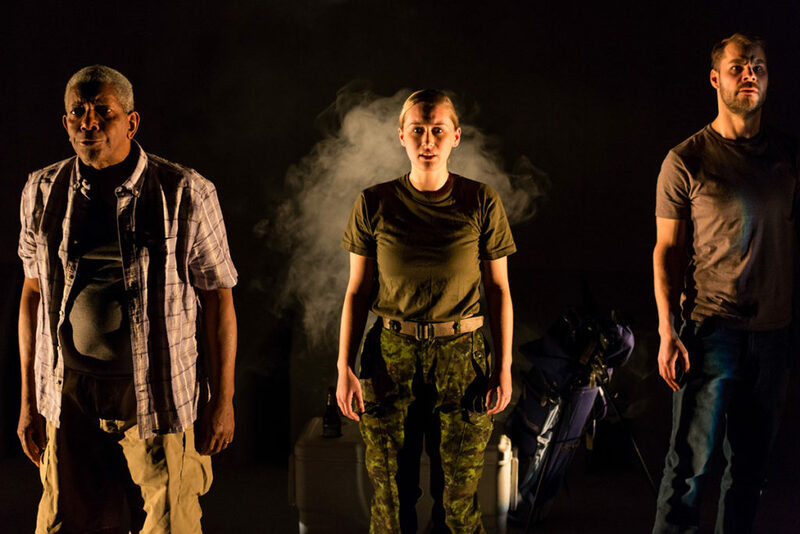 From these three characters’ intersecting experience at the hospital in Afghanistan, and their struggles to reintegrate into Canadian society, we are shown an honest, visceral representation of a side of war less seen: that of the brave medical personnel who risk their lives to save others, no questions asked.